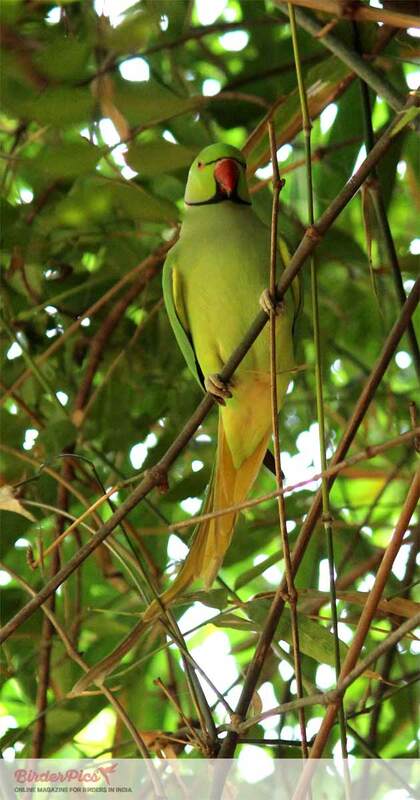 Commonly known as a parrot, the rose ringed parakeet is a popular cage bird in India. This is because of its ability to mimic voice of humans. The rose ring parakeet is also known as ring-necked parakeet. The rose ringed parakeet has extremely large range. This species have adapted successfully to living in disturbed habitats. It can be seen in forests, in rural areas as well as in urban areas. Rose-ringed parakeet is not a monogamous. It breeds once a year in spring. A Female lays 3-6 eggs, which incubate in 23 days. Fledgings are ready to leave the nest before monsoon. The parakeet is herbivorous. It feeds on fruits, vegetables, nuts, berries, seeds. It forages on land in the wild. Plumage: How does this bird looks. The rose ring parakeet is sexually dimorphic bird. The male develops a black ring around neck between 18 months and by 3 years the ring is highlighted with pink and blue. The female do not have a ring like male, but female do show a lighter green ring that can be seen upon closer inspection. It has a lime green body and a bluish tail. The wing and tail feathers show bright yellow which can be seen underneath the bird when in flight. The bill is cherry red. There is a yellowish ring around black eyes. Its average size is 16 inches, in which its tail makes up large portion. Parakeet is a highly social bird. It is non-migratory bird.